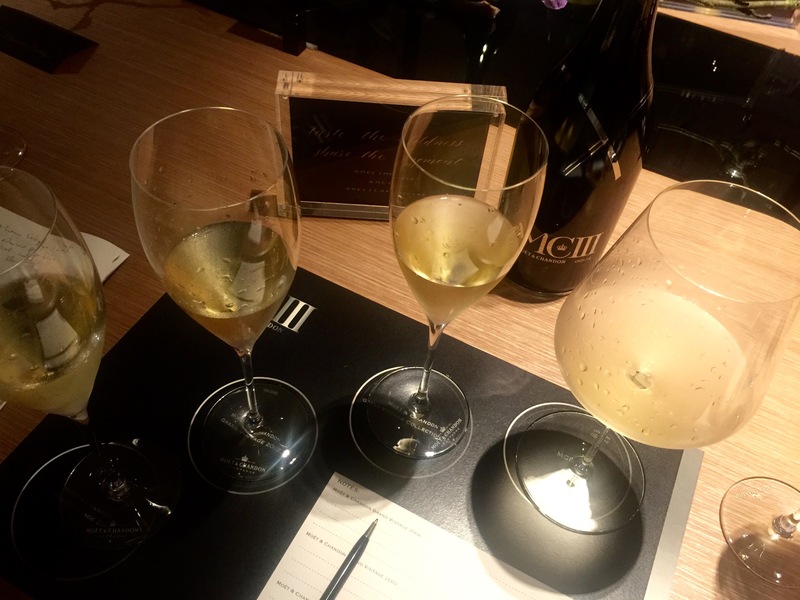 I recently had the luck to have a good sit down, tasting with Benoît Gouez, whom has been the chef de cave at Moët & Chandon since 2005, talked about their new baby, MCIII, a multi-vintage Champagne from the assembly of three wines all raised differently, in metal, wood and glass. Here is some sharing. To me, this Champagne is quite interesting, as well, delicious. How do they make it? First it consists of 37%-40% Chardonnay and Pinot Noir from 2003 were vinified in stainless steel tanks which gives fruity dimension to the blend. Then the 2nd stratum is made from the wood (around 37%-40% ) they added Moët ‘s “Grand Vintage” 1998, 2000 and 2002 which partially aged in oak casks and then preserved in stainless steel vats. Finally, the assemblage (around 37%-40% ) is completed by Moet’s vintages from 1999, 1998 and 1993 aged in glass bottles (like what you would normally find in the market). “This layer complete the balance of the final assemblage by integrating a dimension that is lively and full of vitality with more roasted note and depth, turned into an eminent maturity evoking refinement and radiance,” said the house. Surely, it takes guts to disgorge some good bottles of 1999, 1998 and 1993 and pour into the blend which may possibly fail. It also takes a very large cellar stocks which Moët has, the world’s largest cellar of vintage champagnes. Nothing comes easy, and certainly some good bottles were wasted, in fact, they failed twice, if anyone actually know about it. Their first blend was in 1998, using the base wine of 1998; and the 2nd trying was in 2000 and both were not satisfying until 2003 which I am tasting now become a success and finally released to market end of last year (soon in HK). Ripe on nose with apricot and mandarin. Rich and good structure however, not as fresh as the less hotter years. A bitter sweet finish. Citrusy, peachy, spicy and biscuits to start with. Lively with great acidity on entry and rich with good complexity and structure, great texture as well. Long lasting tasteful finish, a pink grapefruit touch. Love this the most out of all. Rich on nose, mature with bitter grapefruit, honey and toffee notes. Rich full body with “brownness” flavors such as chestnuts, dough, toffee and a long finish. Disgorged in 2014, this wine has 10 years of assemblage and aged in cellar. Very fine mouse (most refine compare to the previous 3 vintages), however, nose wasn’t as expressive as one would had expected despite a Zalto glass been used. It was interesting though, opens up from toffee and mocha, pastry like note to citrus, mandarin peels then oysters seashell notes. On the palate, it was fantastic with the highest complexity among all. Definitely more interesting then the nose one may had anticipated. White peach, pink grapefruits, nutmeg, fresh yet mature at same time. MCIII evolves towards a long mineral finish with a bitter saltiness touch. A contemporary one I must say. not cheap though roughly on the HKD 2k plus per bottle, would say if you are not tight in cash, it’s definitely fun and worth a try.